Podemos was born one and a half years ago. It presented itself as something new, a participatory movement “open to all citizens”. Referring to the movement of the Spanish “indignados” (the ‘indignant’ or ‘outraged’) that emerged on May 15, 2011, Pablo Iglesias at the time announced that, “We said in the plazas that it can be done and we are saying today that we can do it”. Spanish version from Ideas de Izquierda, July 2015. On May 25, 2014, the new political formation burst onto the Spanish political scene, obtaining over 1.2 million votes and five Members of the European Parliament (MEPs). That was the first electoral milestone for Podemos, which then began its transformation into a party, adopting a centralized internal organization, moving away from its “participatory” method towards one based on plebiscites and adopting a reformist program, all with the aim of occupying “the centre of the [political] chess-board”. The Assembly of Vista Alegre in October 2014 consolidated this process. Following this was a series of “political gestures” towards sectors of the regime and the establishment, intended to demonstrate that Podemos was not a “radical movement” or “anti-system” (as the reactionary right in Spain accused them of being), but was instead a “citizens movement” and “moderate”, which sought to occupy the space which Social Democracy had vacated. Pablo Iglesias met with the US Ambassador in Madrid, organized “private” meetings with PSOE (Socialist Party) leaders such as former President Rodríguez Zapatero, enthusiastically applauded Pope Francis when he spoke at the European Parliament and had nothing but words of praise for Barack Obama. At the same time, other leaders of Podemos have started making contacts with businessmen and bankers. The meteoric rise of Podemos in the polls has since plateaued in the lead-up to the municipal and regional elections of May 24. Three factors have influenced this process. On the one hand, the sudden appearance on the political scene of the center-right “Ciudadanos” (Citizens) party, with its discourse of anti-corruption and “regeneration” of the regime, has put a limit on the “transverse” growth of sectors that traditionally vote for the right. On the other hand, the hypothesis of a rapid ‘Pasokisation’ of the PSOE that would allow Podemos to occupy its political space, has not occurred. On the contrary, the “socialist caste” has managed to remain in second position after the Partido Popular (PP – the conservative People’s Party). Finally, although to a lesser extent, the moderation of the discourse and program of Podemos has also had its effect on the decline in votes “for the left”. Thus, from the crisis of the Spanish two-party system, a kind of “four-party system” has started to emerge. In this context, Pablo Iglesias published an article in mid-April that generated some debate within and outside of Podemos. With the suggestive title “La centralidad no es el centro” (Centrality is not the Center), the article referred to what had been one of the fundamental slogans of Podemos: the need to occupy “la centralidad del tablero” (“the center of the [political] chessboard”) and to go beyond – from their point of view – the narrow division between “right and left”. In his article, Iglesias argues that the project of Podemos is not the democratic regeneration of the regime (“the renovation of the elites”), but to instead become the expression of a “political project of a plebeian upsurge”. In this way, what he calls “assuming office without complications” in the “irreverent” style seen at the beginning of the formation of Podemos (a style which to a large extent has melted away), is now compatible with the “defense of the welfare state and social rights” and taking the political argument onto a more “favorable” terrain. There were those who wanted to see this as a “turn to the left” by Iglesias, in the context of a political dispute with his second in command, Iñigo Errejón, around the orientation of the party. But it was far from the case. For Iglesias, the centrality was marked “by what (former Socialist President) Zapatero has pointed out; a project of economic redistribution against the dogmatism of austerity”, that is, occupying the electoral space left by “the exhaustion of the currently existing social-democratic parties” by appropriating their discourse and their program. In this way, he is trying to rearm and revitalise his discourse in the face of falling opinion polls, in order to compete in the “available” space opened up by the crisis of social democracy (which has become openly social-liberal), while at the same time maintaining his strategy of evolutionary changes to the institutions of the regime. In a recent interview , Iglesias gives more clues of what this move to “occupy the centrality of the political field” means. After the sudden appearance of Ciudadanos onto the political scene, Iglesias says that “this shift is relocating us on what we have considered from the beginning to be a losing axis – the traditional left-right axis. We believe that on that basis there is no possibility of change in Spain, and the risk we face now is being relocated precisely on that axis, as opposed to defining a new centrality that, to repeat, has nothing to do with the centre of the political spectrum”. The curious example that he uses to explain this strategy is the visit of King Felipe VI to the European Parliament. Unlike the members of the Group of the European Left, who did not participate in the official reception, Iglesias was there to greet the monarch. But, according to Iglesias, he greeted the King with a “subversive gesture”: dressed in casual clothes, Iglesias gave him a DVD set of Game of Thrones . . . so that he can perceive the “fragility” of his own position as King. “Our aim is to dance within this contradiction, within these positionings, with an ironic message that is at the same time a plebeian gesture – and which is so far working very well in the media, by the way – that allows us to shift the axis of the discussion: not monarchy versus republic, a discourse immediately interpreted in terms of the heritage of the Spanish Civil War, which unfortunately is a losing frame in the battle for social interpretation”. Within the political thought of Iglesias, the allusion to a “plebeian upsurge” is nothing more than rhetorical. It in no way implies the search for ways to “unleash” the energies of the working people and the sectors most affected by the crisis as a way of enforcing their demands. With the logic of occupying “the centrality of the political chessboard” and separating itself from the territory identified with the left (or the far left), the leadership of Podemos reduces the field of politics to a media operation based on calculated “gestures” (very well prepared by their marketing team, it must be said) in order to seduce the public opinion of the center. For Iglesias, the debate about monarchy versus Republic is not suitable because “The monarchy is one of the most highly valued institutions in Spain, so that [not recognizing the monarchy and refusing to attend the King’s reception like the republican left does] immediately antagonizes social sectors that are fundamental for political change”. Such are the paradoxes of a reformism without reforms and a “plebeian upsurge” that neither intends to erupt, much less be plebeian, as this position is not even posed; no development of social mobilization in the here and now, and not so much as an opening up of a public debate on the persistence in the 21st century of such a reactionary institution as the Spanish monarchy. The elections of May 24, 2015 have greatly changed the Spanish political map. In the main cities such as Madrid, Barcelona, Valencia, Cadiz, Zaragoza, Santiago de Compostela and others, the various “citizen” candidates made of coalitions of Podemos and other left-wing forces are now governing in the city councils. The most important cases are without doubt “Ahora Madrid” (Now Madrid), headed by the retired Supreme Court judge Manuela Carmena, and “Guanyem Barcelona” (Let’s Win Back Barcelona), led by the anti-eviction activist Ada Colau. However, in the majority of cases the results were not enough to form government with an absolute majority, as occurred in Madrid. In order to govern, the new “citizen candidates” needed the support of the PSOE, who gave them the numbers to form working majorities at the municipal level. The PSOE then had this favor returned to them, with the “citizen candidates” helping the Socialists to obtain the position of President in a number of autonomous communities. Podemos presented these transactions as a “turn” by the PSOE towards its program. Nevertheless, the wave of agreements that took place in recent weeks signify a new step in the political adaptation of Podemos to the rules of the game of degraded Spanish bourgeois democracy, in negotiating directly with one of the pillars of the political regime of 1978. Despite all the rhetoric about being “the new thing”, the logic of the “lesser evil”, something that was so traditional among the Spanish left in recent decades, still survives in the DNA of the leaders of Podemos. Landing in government in important cities soon raised for Podemos and its “citizen candidate” allies the harsh test of power. Embedded within the very logic of ‘management’, these candidates quickly ran up against the “limits of what is possible” in the process of ‘change’. This can be seen for instance in Madrid: not even a week of government had passed before the new female mayor began a series of “renunciations” of her own – quite limited – electoral program. 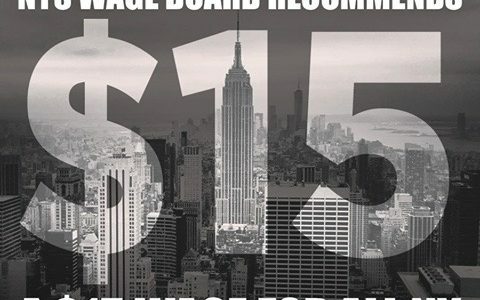 One of the main limits of these reformist phenomena occurs in their attitudes to large social problems faced by the majority of working people, such as the banks evicting families from their homes, along with its respect for capitalist legality. The statements of the new female councillor for housing in Madrid serve as an example. Not long after assuming office she said that, “the Ayuntamiento (city council) cannot stop the evictions” and “if a judge tells you that you have to evict people, then you have to evict people, we will do what we can to alleviate these situations . . .”. Having given up any perspective of social mobilization when it comes to implementing their own social agenda, the new reformist governments run into the insurmountable limit of their absolute respect for the “sacred” property of the banks and capitalist legality. On a much larger (and more tragic) scale, this is the same situation that we are seeing in Greece, where the Syriza government has capitulated to the main requirements of the Troika in just five months and abandoned the principal points of its Thessaloniki Program. Yet despite all the concessions, the Troika requires even more austerity. 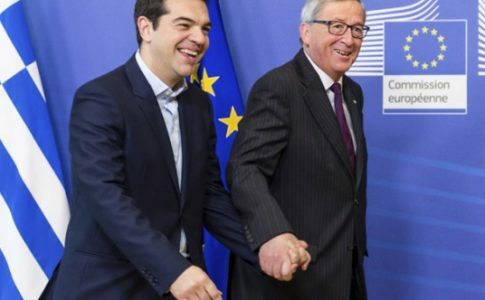 In this scenario, Alexis Tsipras has called a referendum, calling on the Greek people to accept or reject the ultimatum, while continuing to defend his proposal to the creditors that includes tough unpopular measures. In the face of the imperialist offensive of the Troika, the workers and people of Greece are completely disarmed. The Syriza government has become a reflection of the impotency of the new European reformism. The results of 24M (May 24, 2015) not only reconfigured the Spanish political map. They also showed the relatively poor results for Podemos candidates where they stood alone in the Comunidades (“Autonomous Communities”, Spanish regional governments), as compared to the results for the “citizens’ convergence” candidates for the Ayuntamientos (city or local councils). This phenomenon has encouraged various sectors to push for “popular unity” candidates that would unite all the political families to the left of the PSOE for the general elections. The debate is underway. Sectors within Podemos have published the manifesto “Abrimos Podemos (Let’s open up Podemos): for a constituent candidacy”, defending the idea that “the emergence of important municipal forces in major cities saw Podemos situated within a good number of them, but without being able to claim an exclusive role within any of them”. Anticapitalistas (Anti-Capitalists – the association formed by members of Izquierda Anticapitalista after it dissolved into Podemos), insists that Podemos is not the “subject of subjects” and promotes the idea of moving towards the coming together of other left-wing forces in the lead up to the general election. However, the most important movement in this debate has occurred within Izquierda Unida (IU – United Left). Beaten and in deep crisis after its electoral failure on 24M, where they obtained the poorest results in its history, IU has tried to recompose itself before the general elections with the formula of unity. The spokesman for this policy, Alberto Garzón, openly called on Pablo Iglesias to join together in a common candidature. However, the response of Iglesias was brutal: “stay in your place. You can sing the Internationale, you can have your red stars . . . I am not going to mess with any of that. I might even turn up on occasion (. . .) but I do not want anything to do with politics like this. Leave us alone and let us live in peace”. 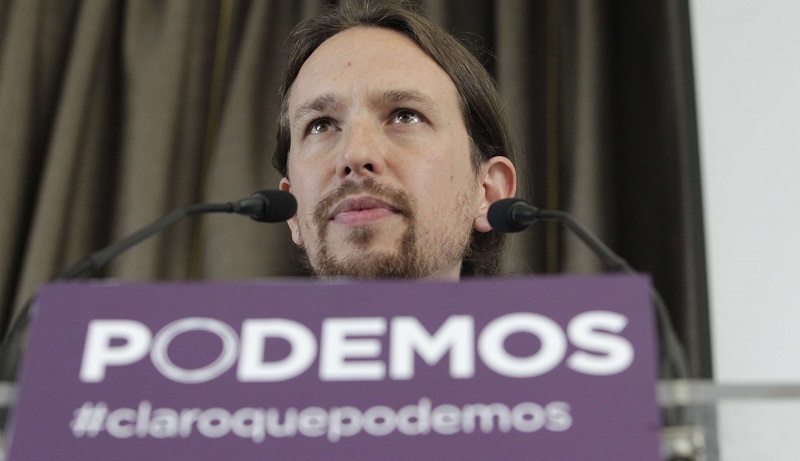 According to Iglesias, there are two possible government scenarios which Podemos should prepare for. If the PSOE stays ahead of Podemos as the first or second force, then Podemos will support a PSOE Government, although he will “not like it”. If Podemos stays ahead of the PSOE, the PSOE will be obliged to support a Podemos government against the PP. The “Podemos hypothesis” is based on these scenarios: challenge the PSOE for the “center” in order to surpass it electorally, even though an agreement would be inevitable. The key is in the relation of forces. This strategy is the opposite of that which Tariq Ali suggested to Pablo Iglesias during a recent interview on Iglesias’ internet TV program ““Otra vuelta de Tuerka” (Another Turn of the Screw)”. The Pakistani historian told Iglesias that “the break with the extreme centre is crucial”, because what has stimulated the emergence of the “new left” is “the desire to break with the existing parties of the extreme center”, as Ali defined the pair of European conservatives and Social Democrats. 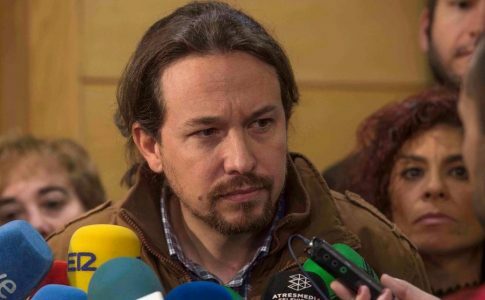 The attempt to contest for the center and aim for a pact with the PSOE in order to get into government is one of the main reasons behind the flat refusal of Iglesias to establish a “popular unity” candidacy with Izquierda Unida. But another, no less important, reason is the attempt to maintain the position of “hiperliderazgo” (hyper-leadership) in the “renovation” of the left, something that he has managed to impose since Podemos was founded. The debate is not on the terrain of program or strategy. 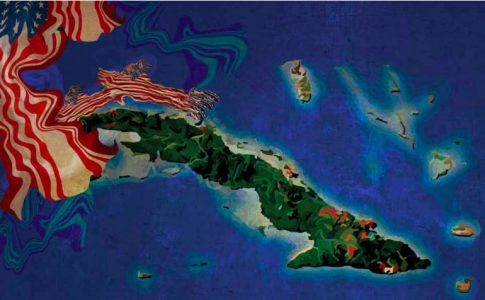 Both formations share a reformist perspective, a mildly neo-Keynesian economic orientation and a political strategy of managing the institutions of state without calling the real powers of Spanish and European capitalism into question. The problem for Iglesias is that Izquierda Unida, which despite being heir to the Eurocommunist tradition of Santiago Carrillo and the PCE (Communist Party of Spain) – a fundamental player in the Transition that allowed for the birth of the hated regime of 1978 and reached a compromise with the monarchy and the retreating Francoist regime – is still too closely identified with “red flags” and “the left”. An alliance with IU could redefine Podemos as a part of the dreaded “marginal left” of the political chessboard and and become, as they say in Buenos Aires ‘lunfardo’ slang, “piantavotos” (a political and electoral liability). The ongoing debate poses the need to promote an independent position. What is needed is a perspective that promotes the development of social mobilization and the class struggle in order to impose a revolutionary constituency process over the ruins of the regime of 1978 allows for the discussion of absolutely everything to take place and opens up the way for an anti-capitalist solution to the crisis. This task is the greatest challenge ahead for the anti-capitalist and revolutionary left of the Spanish State. 2] Josefina Martínez and Diego Lotito, “Syriza, Podemos and the social-democratic illusion”. (Available in Spanish only. Josefina Martínez y Diego Lotito, “[Syriza, Podemos y la ilusión socialdemócrata ”, Ideas de Izquierda (IdZ – Ideas of the Left) No. 17, March 2015.